So i have some keihin carbs from a 1980 cb650. The choke valves dont open or close by them selves but what i want to know of its okay to use them anyways and just leave it open? Could i just manually reach in there and choke it or do those flaps open and close when accelerating? WiseTurtle wrote: So i have some keihin carbs from a 1980 cb650. With cold engine they should be closed and slowly be open up when the engine gets warmer. I'ts not any automatic choke so a knob somewhere near the middle of the handlebar should exist, but if i'm correct the choke wire could be broken. Throttle butterflies and choke butterflies are two different things. The throttle butterflies only exist for the CV carbs, the throttle for the piston carbs directly acts on the pistons. 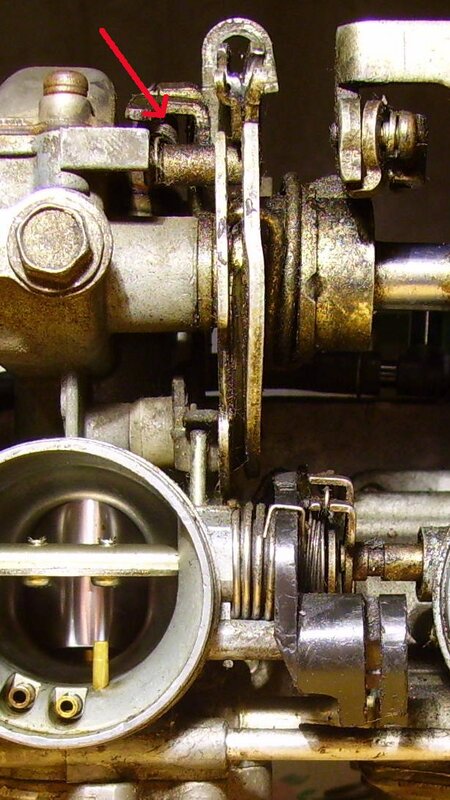 The choke is purely mechanical for both, the choke cam is two halves connected by a spring mechanism shown below for the PD/piston carbs. If you can access it another way, you just can open/close it as you need it manually. BTW, the arrow indicates the spring for the mechanism that opens the throttle a bit at full choke. Not sure if you possibly loose that function without a choke cable. That spring is for the accelerator pump. There is an adjuster screw on the bottom of the throttle body/cable attachment pulley part. The adjuster screw rides on part of the choke to open the throttle a bit. You are right, I mixed that up. It has been three years now that my CB is gone and obviously I start to forget some things with time. Or in other words: I'm getting old! Damn I completely forgot about these topics because I sort of gave up for awhile and forgot my username and password. For whats it worth thanks for the replies from two years ago?! Man i feel real old. Welcome back! How is the bike doing? The bike runs well but Im still fouling plugs after every couple rides it seems. Ive been through the carbs multiple times everything is clear,new seals and valve needles set at 12.5mm. Pilot screws are set at 2 1/8 of a turn which is supposed to be lean according to the manual. The bike can start without choke and idle fine but if I choke it it will sort of bog down like its struggling. I thought it was a weak ignition and finally found that both coils were split open but that did not solve my problem, it used to run crappier after it got hot with over revving and little power but not with the new coils now. No joke I've gone through about $60 worth of D8EA spark plugs already. I've gone on both long and short rides, high revs or low they still fouled every time I checked them. I also do not ride with choke. Let me know if you need pics. Hi WT, when you say the plugs keep fouling can you tell us if they are fouling with oil? Does the bike smoke on start up but clear up after being ridden a while? If any of these answers are yes then I would suspect your cylinder head valve stem seals. The plugs are carbon fouled no oil. Very dry sooty black and you can scrub it of with your fingers except for the electrode part. The third cylinder plug used to be half fouled on one side and other side was white/clean. Two weeks ago I did a carb sync and now they all foul completely as team again. There is no smoke at all on startup or when its hot. Im running larger valve clearances in case that has anything to do with it. I am also running 20w-50 synthetic oil in this beast because of the hot climate here in SoCal but I dont really idle much at traffic. How long do you think it takes for the plugs to reach operating temperature to burn off the carbon? Well in that case I would say that your mixture is too rich, if your valve stem seals had failed your plugs would be oil fouled. I wonder how easy is it to access the choke wire from above? Does it exist any see through drawings where i can see how close the wire goes to the airbox connections? Last edited by MEHall on Fri Mar 16, 2018 7:54 am, edited 1 time in total. The choke issue has been fixed awhile ago, sorry I never mentioned that but I was able to find one on ebay for $30 after searching for two months. Okay, so I took my bike out for a much longer run about 20 miles back and forth through different throttle positions and I ran it as high as 7k racing through the streets on open stretches (no cops ). The new plug was not ony carbon fouled but it has brown stuff on it which I had never seen before. Looks like the plug heat range maybe? Looked at an old listing where I bought my rebuild kits for the carbs and the main jet is #95. Could this be the problem of running to rich? The PD50B carbies are 90 mains. Tomorow Ill just take the carbs and but the original jets that came with the bike back in.